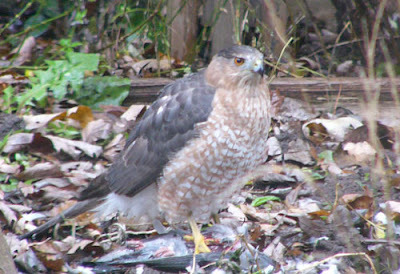 It's always about Thanksgiving that we see our first hawk kill in our backyard. 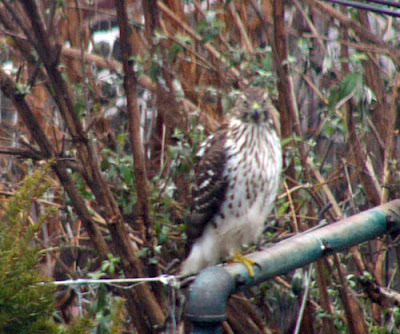 Usually it's an immature Sharpshinned Hawk but occasionally it is a Cooper's Hawk and I'm pretty sure that's what this is, this time a mature one. It's been cold and rainy this weekend so we've had more bird visitors than usual, a very quick visit by eight Common Grackles, two Carolina Wrens - one more than our previous high count, and our first Northern Mockingbird in awhile. Unfortunately for the other feeder birds I guess the hawk was just as hungry as they were. I believe that is the remains of a pigeon beneath his feet. He eventually flew off with it so there's not much left to help identify his victim. Most of the color is also gone from the garden by this time of year. But the Zinnias seem to keep just the faintest sense of their original color. Here their fascinating shapes are a good counterpoint to the largely barren seedheads of Fennel. 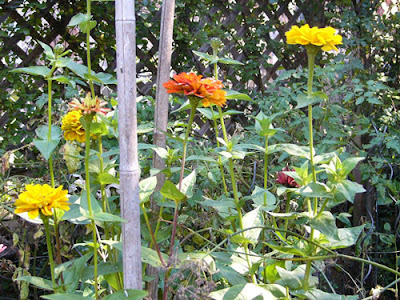 It's hard to see these spent Zinnias each fall and not think of Piet Mondrian's wonderful Chrysanthemum drawings. Their structure cries out to be put down on paper. I've always wondered if the Mondrian drawings don't hold some clue as to his real visual intent in his later abstract paintings. Artists' motivations are many but I can't help but think that one of them is to put down on paper, to concretize if there is such a word, the fascinating structure of nature. In an earlier post I mentioned 'carving three dimensional objects out of the two dimensional space of paper' or something very similar. These Zinnias just seem to say: "You have to draw us! Please concretize us!" But so does that hawk. In fact all of nature puts its structure on display over the next few months, all of it crying out to be drawn. Well we shall see. 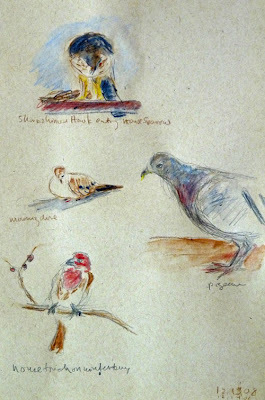 I did spend about two hours today drawing Mourning Doves, House Finches and Juncos at or around our feeders, this time with pencil and waterbrush and watercolor. They're an improvement over the first felt-tip pen attempts of a few weeks ago. But I've put up too much questionable art recently. So I'll wait for something more successful before posting it. I think I've now made a convincing case for the fact that I can do so-so art from life. It's probably best to wait and show some sign of improvement! I do remain confident that they will get better. For many years we've always taken a break from our Thanksgiving meal preparation to take a walk on Forbidden Drive at the Wissahickon Creek in Philadelphia. Sometimes it's fairly eventful and we may see a Pileated Woodpecker or two. At other times it's much quieter. Still it reminds us of much that we have to be thankful for, especially being so near to this place of natural beauty and life. It has always seemed like the perfect entertainment for a holiday like Thanksgiving. Thursday's walk found this White-breasted Nuthatch on a limb that crossed in front of some of the Wissahickon's metamorphic rocks. I wish I could name the rock. It looks like the greenstone we often see in Shenandoah National Park but I just wasn't paying that much attention to it when I took the photo that served as the basis for this. But it sure does look metamorphic. We also saw two other Nuthatches, one Carolina Chickadee and our first fall Brown Creeper in Philadelphia, at least 50 feet high in Sycamores and other trees. This seemed surprisingly high to us. That was one of the few places that the sun was shining though so it might be that insects were active there and the Creeper knew this. He was busy scouring under the bark. My birthday occurred recently and among my presents were a couple of waterbrushes. 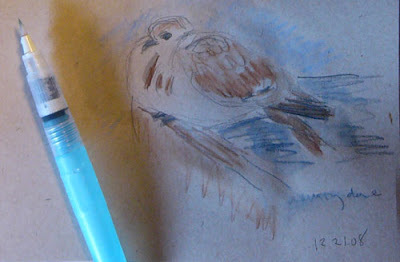 I started playing with them yesterday and hope to do some more life drawings of feeder birds today and tomorrow. I also used them in this first waterbrush watercolor. It's not quite a lump of coal but leaves very much to be desired. But it was a useful experiment in using the waterbrushes and shows me that they have a lot of potential, especially for field sketches. If I have any success with feeder birds and waterbrushes this weekend I may post them later. The painting also reminds me of all the improvements I need to bring to my watercolors. That is sobering but still useful. Normally I probably wouldn't post this image. But it does serve as an illustration for our Thanksgiving walk and that is worthwhile in itself. Many years ago when I took my first ceramics class at City College of San Francisco the instructor said that opening the kiln to see how your work had fired was like Christmas, you never knew what surprises might be there. It could be a shiny new bike. Or it could be a large lump of coal. Painting is a bit like that, especially if you work late into the night, when all good light is gone and colors are no longer true, and your mind is probably not as alert as you think it might be. What surprises will the morning bring? Last night was like that. I worked too late in bad light. This morning greeted me with a disappointing painting but not much more disappointing than when I'd quit last night. I've done more work on it this morning and it's most likely done. As usual I've lost more white paper than I'd like and the painting could be helped by some remaining white areas or light areas. In fact as I look at this painting next to a newer one a few days after this post I see that it's really lacking much in the light end of the tonal spectrum. The other painting is much brighter and shows the luminosity that is watercolor's strength. In trying to unify the background grasses I also killed off some of the lighter areas and some of the bright luminosity along with it. But I do think the painting is more unified that it was last night. 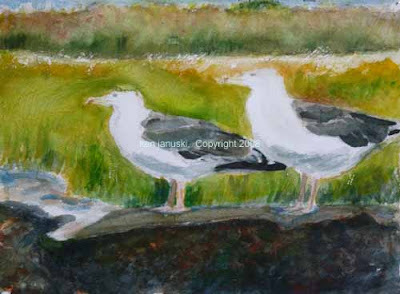 And the gulls do show off their bright whiteness. So at least it is not a disaster. I still have much to learn about controlling a water color brush, especially when it comes to the feathers of birds. But I've told myself that I need to continue work on larger watercolors and get away from the 7x10 inch watercolors that I normally use for a watercolor sketch like this. This is my first attempt on a quarter sheet of paper, about 15x11 inches. This really is a more comfortable size for me and I think I'll continue to use it for any studio sketches. 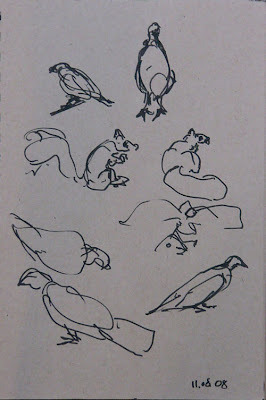 As with drawing birds from life you just need to do it, not think about doing it. So that is the motto for this winter for drawing from life and working in watercolor: Just Do It. If I'm lucky I won't have a large collection of coal when I'm done. Just a quick post today to show work on a new watercolor. 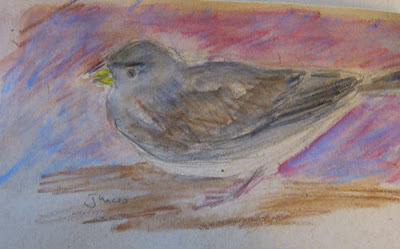 I've decided to spend an hour or two each weekend drawing from life birds feeding at our feeders. This began when Project FeederWatch started three weeks ago. If the opportunity presents itself for a more full scale work from life I'll try it. If not then I'll work from my photos. 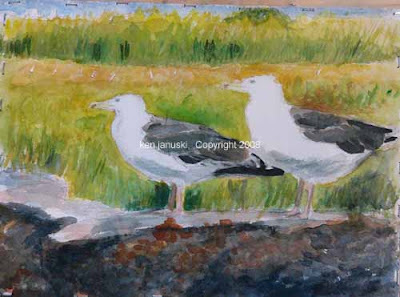 Today was fairly quiet at the feeders so I decided to return to my nemesis watercolor and begin one of two Greater Black-backed Gulls seen from 'The Osprey' shallow draft boat in September, 2008 at Cape May, NJ. I guess you could say that this is the Winter of Nemeses. First drawing birds from life; now watercolor. What doesn't kill you makes you stronger. So here's hoping that I grow in strength as I battle these two nemeses. As I've said before I do really like watercolor. But it requires more preplanning and discipline than I'm used to. We shall see. This is a start but there's a long way to go. The memory in the title of this post refers not to how memory works in birds (who would know?) 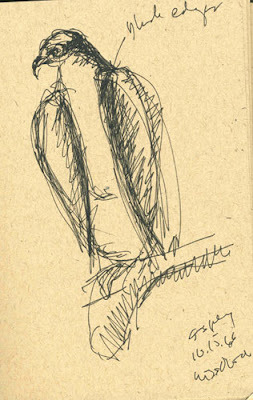 but how an artist needs to use his memory of a bird to draw him or her. The drawing above is not drawn from memory or from life but is informed to some extent by my memory of all the birds I've seen and drawn. 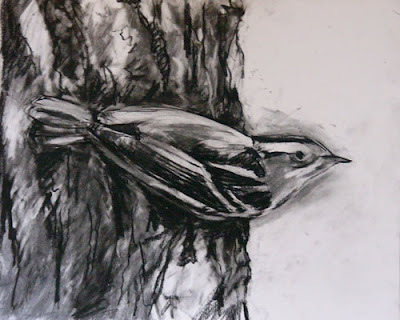 This is my newest charcoal drawing, based on a photo of a Black and White Warbler taken in the trees right outside the Cape May Bird Observatory office in late September, 2008. Cape May has a wealth of good birding spots but sometimes one of the best can be right around the office. Easy birding! 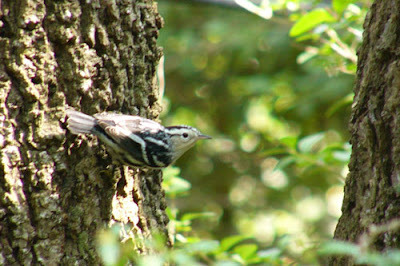 Along with many warblers we saw that day here we also saw our first Brown Creeper of the fall. 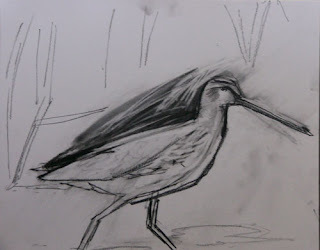 I continued my live bird sketching this week and it's improving. But there is still a long way to go. One thing that live sketching forces you to do is make quick decisions. 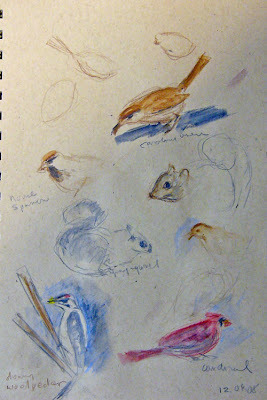 Birds, at least feeder birds, have often moved by the time you get pen or pencil to paper. So if you want to be successful, and I say this as someone who's not, I think you need to think as you draw. What should I put down first? The head? What shape is the head? The torso? What shape is it? Where precisely are those dark markings on the throat of a House Sparrow? How does the bill join the forehead? That's the gist of what I learned this week and my sketches have improved a little. 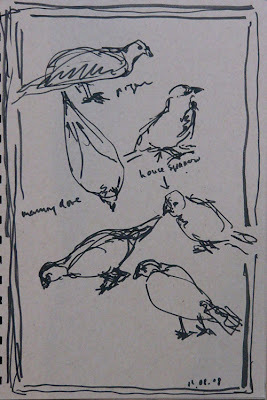 In sketching, if you want to get more than just a sense of movement as in some of the sketches in my last post, you need to recall what a bird looks like, how the bill meets the forehead of a House Sparrow, at the same instant that you are putting pen to paper to catch the bird that's about to move. It's challenging, sometimes so challenging as to make you want to give up, but also exciting. Will you be able to be a bit more successful this time? This is part of the excitement I mean when I talk about the values of drawing from life. All well and good you say but why show a drawing based on a photo? Well for one because it's my newest drawing. I'm still not sure if it's done. But also because I drew it after some life sketching yesterday. Though you may well understand the various large feather tracts of birds, e.g. 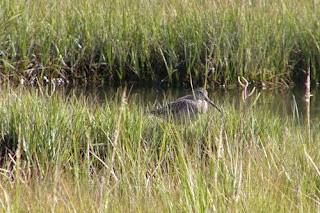 greater coverts, primaries, etc., it's very hard to see them in the brief time in which you see a bird you're trying to sketch. Still that knowledge can help you as you make split second decisions as to what you put down on paper. 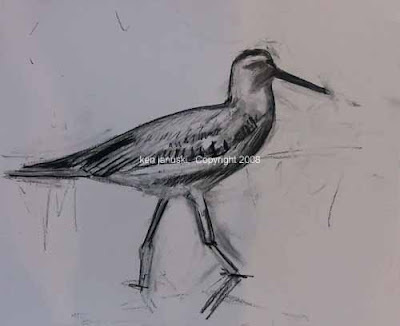 You look at the bird, review your memory of bird feather structure, think about how you can apply that to this particular sketch, remember what you might have learned in previous sketches and put pen to paper in a second or two or five at most. 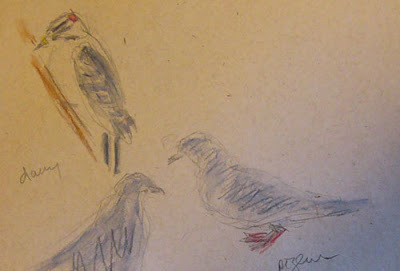 As I was working on this drawing I recalled some of what I'd just experienced in sketching House Sparrows, particularly regarding location of feather tracts. The photo is based on just the flat representation of what the camera saw. The photo is just marks on paper; it's not the complicated three-dimensional object itself. The great danger of photos is that they are two-dimensional just like drawings. So in a way the translation is easy. You are going from two dimensions to two dimensions. But a bird, or anything else, is three dimensional. The type of drawing I want to do goes from two dimensions(the photo) to three dimensions(what the photo represents) to two dimensions(the drawing). To do this successfully you really need to understand the structure and volume of the object you're representing. The best way to do that is through the knowledge and memories gained from trying to get down on paper a bird that won't sit still for more than a split second. 'Neural memory', if I recall correctly, is what the Motmot called it. It's part of what makes some drawings seem much more lifelike than others, and I think it's probably also part of what makes drawing from life so rewarding, even with all of its frustrations. or maybe just a squirrel if the birds were too bad, but even that was tough today, the first day of Project Feeder Watch. As I've written many times both here and on my main web site I really prefer working from life and not from photos. There is an immediacy that the artist tries to capture when he's drawing what is right in front of him that is lost when working from photos. I work only from my own photos so I have more of a connection than with someone else's photos but still there is something lacking. However I know that the beginning of Project Feeder Watch will soon show me what a dangerous idea that may be. Live birds, particularly when they're feeding, can make me look like a rank amateur! But as the Motmot says you've got to own a bird, not like owning a pet bird, but in the sense of knowing some birds well enough to draw them blindfolded, or as she says "the essence of the bird is yours to keep." Project Feeder Watch is one of many Citizen Science projects sponsored by the Cornell Lab of Ornithology. 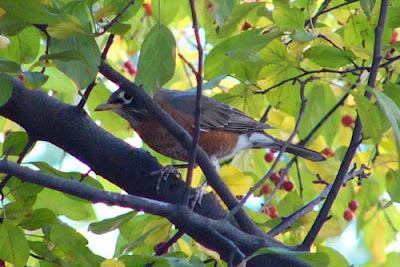 It strives to use ordinary citizens to collect important data about birds. The sheer numbers, especially when done in a controlled way, prove valuable to scientists in studying bird populations, bird behavior, etc. In Project Feeder Watch people count the birds that they see at their backyard feeders from early November until late March or early April. It's both fun to do and scientifically useful. For me it is SUPPOSED to be the chance to force myself to work from life. Well as much as a brick wall offers me the chance to bang my head into it.... Just kidding. It is an opportunity and I'll take advantage of it, I hope more this year than last year. But as you can see it is a challenge. Those birds just won't sit still. Most birds I've drawn on these two sheets held their pose for less than 2 seconds. I hope the drawings will show an improvement by the end of Project Feeder Watch season. I'll be doing my best to make sure that they do. We spent a brief hour at the Wissahickon today, looking for birds, but also enjoying the brilliant colors of fall. Birds were incredibly scarce. We saw only two, a Hairy Woodpecker and a Red-tailed Hawk. But it was still great to be out on a beautiful day with most leaves still retaining their full color. I think that oaks might very well be our favorite tree. 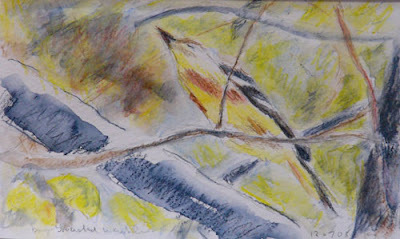 In spring most of the early migrants, especially warblers, can be found at the top of oaks, nibbling the caterpillars that are themselves eating the tender emerging leaves of the oaks. But now in fall their strong colors are the high point. 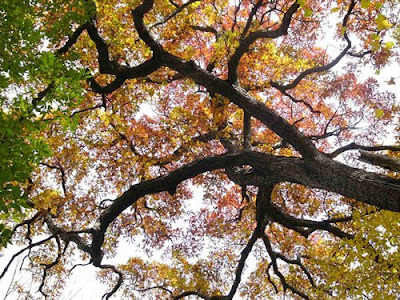 That is until you look up and see the incredible design that the limbs seem to create. I had to choose between a photo that accentuates the color of the leaves and one that shows the beautiful and strong design of the trunk and branches. As you see I just had to go with the trunk and branches. 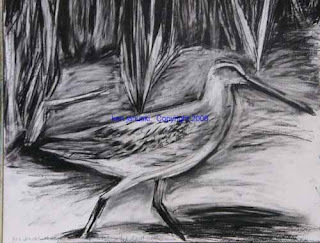 I think that this drawing of a Lesser Yellowlegs is done. 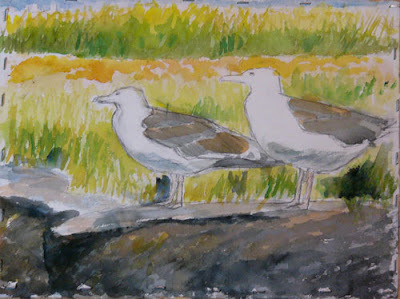 It's based on a number of photos taken at Cape May, NJ in early October. 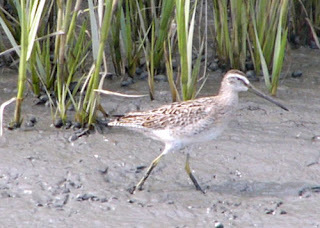 A very handsome Pectoral Sandpiper fed near this Yellowlegs and he might appear in later drawings. Earlier versions of this drawing appear in the last post. That post ends by saying that I hope I can add some background to the drawing without also removing all the life from it. This may make no sense to non-artists but artists I think know that finishing a work of art, whether it be drawing, painting or novel, can be the hardest part. 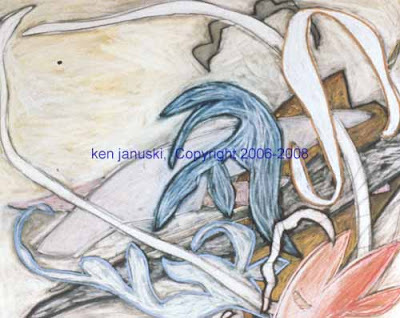 The problem, especially in watercolor or drawing, is that the white of the paper is a very valuable part of the artwork. Once it is gone it is generally gone for good, and yet it's necessary to keep a fresh look to the work. So as you get to the end you get a little more cautious about using up the remaining white space. It's sometimes tempting to just leave the white of the paper, which can sometimes still read as part of the illusion of reality rather than just as blank paper. The second version of this drawing, seen in my last post, is like that. I THINK that the upper background reads as a light filled space, not just blank paper. But I wasn't sure and it certainly did not give any indication of the spartina which is part of what makes the salt marshes of Cape May so handsome. So, knowing I might very well kill the drawing, I went ahead today and added the background. As I developed it I removed more and more white paper. Hopefully it works and is an improvement. 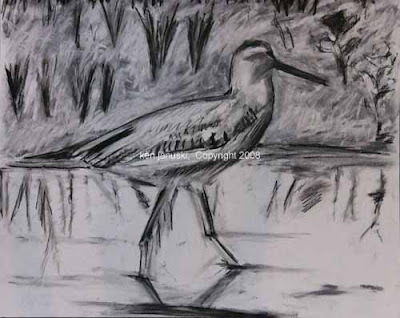 I do think that the Yellowlegs now seems better unified with the background and foreground. It will take awhile for me to decide. If not I'll remember this lesson next time. The lesson of not removing too much white is I think a lesson that artists never stop relearning. But why write about all of this? Well there's certainly the danger of talking art to death. On the other hand I think non-artists might be interested in the many decisions that go into making a work of art. 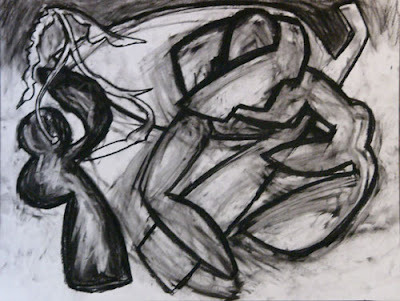 So maybe I should change my post title to this: "Don't Kill that Drawing......with Talk or with Charcoal". I finally got a chance to return to artwork today. As usual the first process is to figure out what medium I'm going to use. The three that I've used exclusively over the last two years are charcoal, pastel and watercolor. 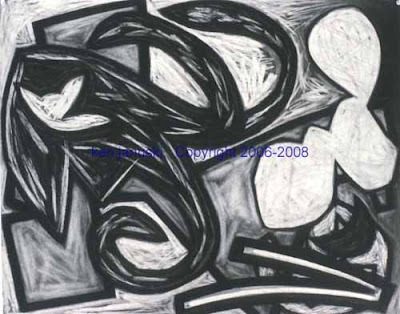 Right now I just don't have time to undertake anything new, like for instance printmaking. So today the first hour or two was spent deciding on a medium. 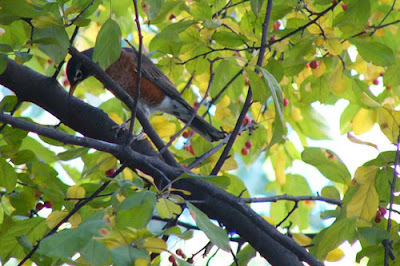 I'd almost gotten out my watercolors to try to remedy a very bad watercolor I started a week ago of a robin in our crabapple when I decided that might be like throwing good money after bad. 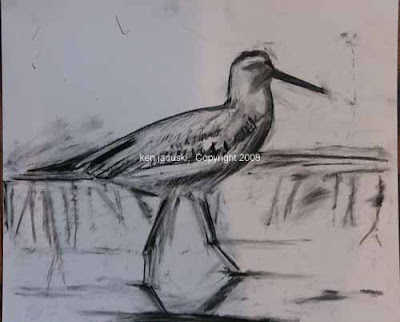 Instead I decided to return to shorebirds and charcoal instead. I wrote on Museworthy's blog recently that I once spent three hours a night, five days a week doing figure drawing for a couple of years while living in San Francisco. I always did this after working at a very dull job and it helped to bring something creative to my day. Work certainly wasn't! I mentioned that I thought I was still influenced to a great extent by all of that figure drawing. 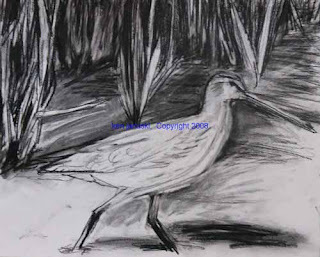 And I think that is one of the appeals of drawing shorebirds. For some reason they seem to take more anthropomorphic poses than other birds, for instance warblers. 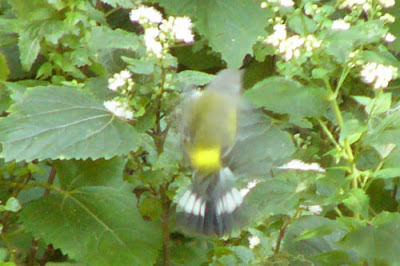 Or maybe warblers do so but they just don't sit still long enough for you ever to notice. They're constantly on the move. What do you do, just listen? This post is a quasi-anniversary for this blog. 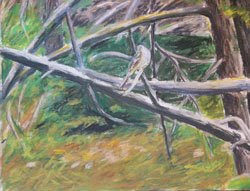 A little over two years ago the sight of an osprey at the Wissahickon Creek in Philadelphia was the impetus for starting a web site devoted to art, birds and nature. About nine months ago I migrated the contents of that web site to this new blog. Near the very bottom of this blog you'll find that post. We had never found an osprey to be a regular visitor there. The only other time I'd seen one was the day after the general election of 2004. So it was a real surprise to find one again 2006. Though ospreys were in great decline in the 1950s due to DDT they have made quite a comeback. 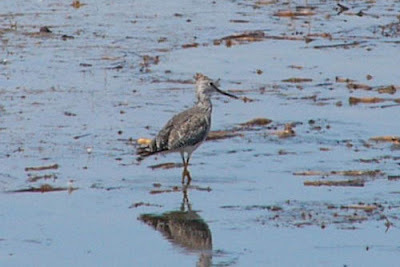 We see them frequently near large bodies of water, often the ocean, especially near Cape May, NJ, but also at the large water impoundments of the John Heinz National Wildlife Refuge in Philadelphia. We had heard rumors of them being seen at the Wissahickon but we'd never seen any ourselves. When we did it was a momentous enough event to get me to start this blog. Yesterday we took a 4 1/2 hour walk at the Wissahickon. This was a well deserved vacation after 6 days of stripping wallpaper, spackling, sanding and painting at home. Many of the same birds we saw in that post of two years ago appeared: ruby-crowned kinglet and golden-crowned kinglet, great blue heron, many downy woodpeckers, et al. But no osprey. Then we heard the full-throated whistle that accompanied the osprey two years ago. Examples of osprey calls can be found at the Macaulay Library of the Cornell Lab of Ornithology. Just search for 'osprey.' It has been awhile since we'd heard him and so I wasn't absolutely sure it was an osprey. another recent post, 'What do you do, just watch them? 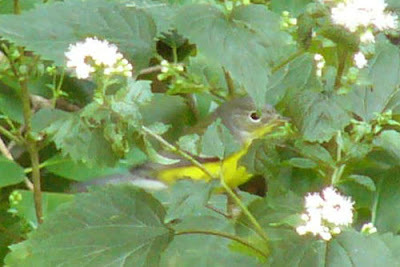 ', in which I tried to explain many of the things that make birding/bird watching so exciting. But the sound of what might have been an osprey reminded me of something I'd forgotten: sound! This is a bit hard to explain for someone who hasn't experienced it. But I've always found it thrilling to be able to walk into the woods, hear all sorts of bird calls, perhaps sprinkled in with the sounds of squirrels, chipmunks and who knows what else, and be able to stop and identify the source of each sound. This isn't perfect of course and I'm often embarrassed at my mistakes. But most of the time they are correct. Now why this should be so satisfying I can't say for sure. But I think at least part of it relates to what I said in 'What do you do, just watch them? ': skill and the sense of being part of a world, and a somewhat orderly one at that, which is far different from the workaday world. As we continued to hear the call I was certain that it was an osprey. And sure enough one soon winged by and down the stream in search of fish. My guess is that the ravine-like structure of the Wissahickon valley amplifies the sounds of birds there and makes them sound fuller than they might elsewhere. I think this is especially true of a larger bird like an osprey, compared to a smaller bird like one of the kinglets. The examples from the Macauley Library noted above are nowhere near as full and rich as what we have heard at the Wissahickon when we hear an osprey. In fact I couldn't think of another bird, at least that we're likely to see there, that has such a full whistle. And that's finally what made me decide that an osprey must be near. Fortunately he soon flew by to confirm this. 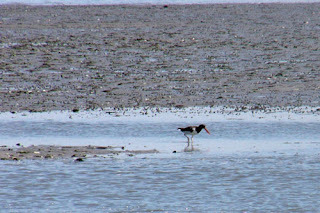 So sound can also be a very large part of birding. If you are interested in bird sounds there is a wonderful book by Donald Kroodsma called The Singing Life of Birds. It includes a CD with sonograms of various bird songs. This might sound just a little too esoteric for many but if you have any interest in birds, and especially if you also have an interest in music, I think you'll find it fascinating. After reading the first part of it, about the variation in the songs of song sparrows, I listened to our backyard song sparrow render over 10 different songs. The guidebooks of course mention the one song of most birds, but after reading this book you'll realize, and hear, that birds are individuals, just like you and I. There was one other similarity between yesterday and our birding trip of two years ago when we saw the osprey: the great blue heron. They are much more frequently seen at the Wissahickon than are ospreys. And yet they're still not all that frequent, perhaps one out of every 5-10 times we go birding there. I just did a quick check to see if there had been a trout stocking there recently and could not find out. But trout are often stocked in the Wissahickon in the fall as well as in the spring. Perhaps that has something to do with the appearance of these two wonderful fish hunters. In late June I received an email from someone I'd never met asking if I'd be interested in lending some of my abstract drawings for use in a short, independent film. Last Friday the drawings returned from their round-trip journey to the shooting in Georgia. As the film's web site says: 'A PEACOCK-FEATHERED BLUE is the story of a 9-year-old boy who’s failing science. Marcel loves sketching and painting, but hates following the rules. When his mother finds out he received an F on his latest test, she threatens to take away his art supplies if he doesn’t come up with a winning science project...' For more on the plot check the above web site. Be sure to mouse over the kites to see the various links. The screenwriter and director, Jenna Milly, thought that some of my drawings would work well to represent the type of creative drawings that Marcel does. The drawing above is partially finished drawing that Marcel is working on as the film opens. I created it especially for the film based on another drawing of mine that Jenna liked. 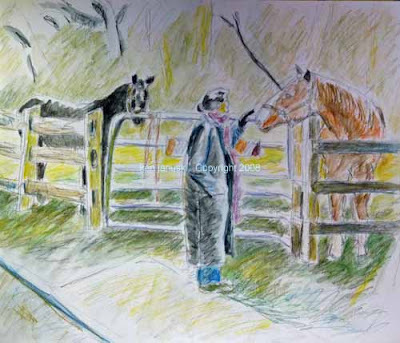 The drawings below are examples of some of the drawings that Marcel has done. They hang in his room at home. They were not done specifically for the film. The film should be finished around March, 2009. In the meantime this site gives a sense of the scene during the shooting of the film. It's odd being part of something where you haven't met any of the other people involved or seen the finished product. At least now I know what they look like and get some idea of what filming must have been like. One photo includes Marcel and my half-drawn sketch. It should be exciting to see it when the time comes. Let's hope it does well and gets into some major film competitions! This will be a quick post because I just wanted to capture a few photos of the beauty of fall in our backyard. 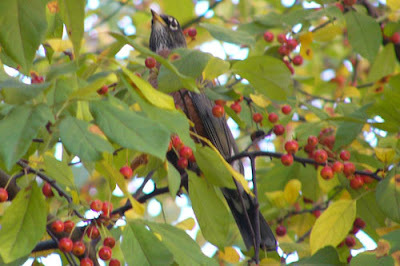 For the first time ever, at least that we have ever seen, robins are rampaging through the yard gobbling down the crabapples from our one tree. We planted it 15 years ago in the hopes of atracting birds but it really hasn't been all that successful. Until the past few days. The tree has been covered. 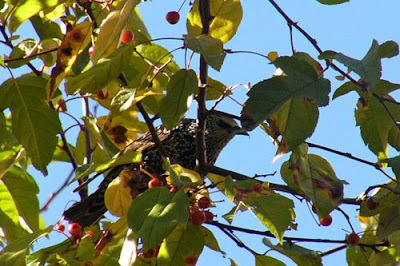 As you may be able to see an insistent, young starling also managed to get in to the crabapple and steal some fruit for himself. Each October our zinnias seem to look their best. They are such pure, rich colors in a world that is starting to fade. In one more effort to save the suet for birds like Downy Woodpeckers and not from thieves like squirrels, I put up a clothesline and put the suet on that. 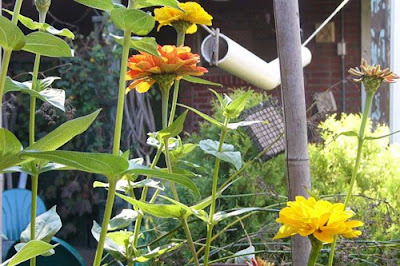 Hopefully the squirrels stay off and the birds enjoy the food and the beautiful view of the zinnias. Our very last color in the yard comes from salvias. 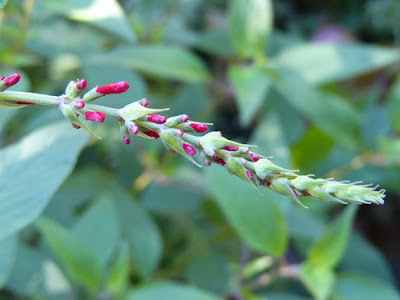 Below is the first sign of color on a Pineapple Sage. Our 'Tula' salvia has not quite started to show its blooms yet. Soon however they'll both be in bloom: the last glorious color before the grays of late fall and winter. What do you do, just watch them? We spent the last week at Cape May, NJ, 'birdwatching' about eight hours a day for five days in beautiful, sunny 70 degree weather. 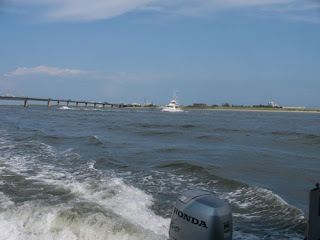 I can't think of a more enjoyable vacation than being at Cape May, NJ in migration season with sunny weather. The accompanying photos are all from that trip. In some ways I think that the pleasures of birdwatching parallel those of flyfishing for trout. Good trout streams are often in very beautiful areas. They are often quiet and uncrowded. So part of the appeal of both is just being outside, enjoying some of nature's most beautiful, and most quiet areas. There is also the sense of sport or game. I suspect that my wife's co-worker thought that birds just pop out and pose for you. That is almost never the case. They are often hidden by leaves, tree branches, other more common birds, or they just won't sit still, as in the Magnolia Warbler below. Sometimes you can just see part of them and have to use your knowledge of them to make a good guess as to their identification, as in the same Magnolia Warbler in another view. At other times, as in the photo below, identification is a challenge of a different type. Just what are those specks high in the sky? 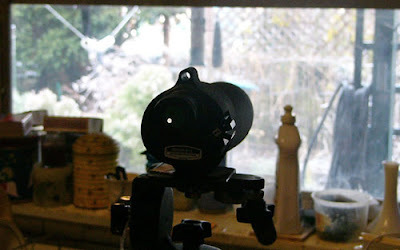 Even binoculars or scopes may not have enough power to identify them clearly. 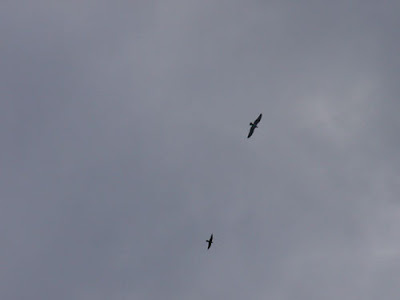 In this case the larger bird is almost certainly an Osprey. The smaller bird is probably a Mississippi Kite, a bird we'd never seen before. But we couldn't be sure of this. Various clues like the manner of flight, color, shape, and the knowledge that more skillful birders had recently seen Mississippi Kites in the same area led to our tentative identification. In other words you need skills similar to that of flyfishermen to both find and identify many birds. But like flyfishing half the pleasure is just being outside in such a beautiful environment. This is particularly true at Cape May. One of the other pleasures is just the beauty of the birds themselves. 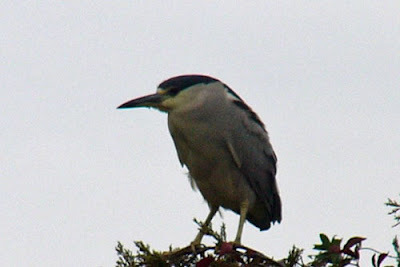 Especially when seen in magnification through binoculars or a spotting scope almost any bird is beautiful. 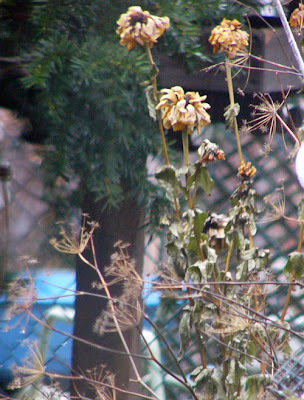 Even the feather pattern of a House Sparrow can seem striking when seen through binoculars. And if the bird is more colorful than a House Sparrow, such as a Blackburnian Warbler, their appearance when seen in magnification is breathtaking. I'm sorry to say that we didn't see any Blackburnians on this trip. 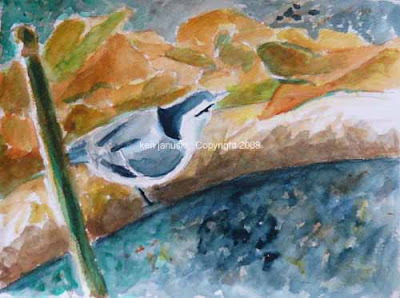 A watercolor of one we saw on another birding trip however, sits atop this page. 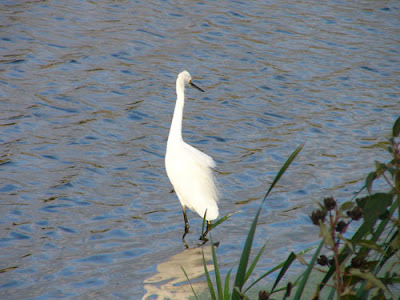 Sometimes it is a more simple, graceful beauty as in the Snowy Egret below. 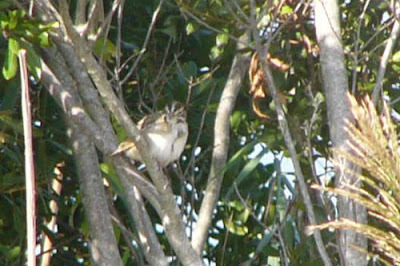 Sometimes the excitement is in just seeing a bird that you've never seen before, as in the Lark Sparrow below. Tbere is always a sense of wonder and discovery in birdwatching. Sometimes it is in seeing a new bird. Sometimes it is in seeing new behavior, as when we say nine Great Blue Herons in flight over The Meadows at Cape May. We think that they were heading off to roost but still need to read up a bit on this to confirm it. Finally there is the pleasure of feeling connected to a larger world than that in which most people spend most of their time: that of nature. The predictable timing of bird migration, something particularly noticeable at Cape May, exposes people to another sense of time. It is a pleasure to feel part of a world that has its own unique rhythms. All in all there is the feeling of being part of a much larger world. Perhaps in fact what is birdwatching for us is peoplewatching for them.